We are the nurturer of souls. The daily tasks that make up the fabric of our lives are necessary and they help us weave into our children the proper ingredients for soul-growth, but we cannot “miss the forest for the trees”, getting so preoccupied with daily routine, cleaning and organizing, that our children become just another task. They are people…they are eternal…they are worth our lives. I’ve come to a simple but reluctant realization this year: mothering a large family is a full time job all by itself, and THAT’S OK. I once felt guilty about “not doing more.” Our culture is largely to blame because it treats children and motherhood like a peripheral job, not worthy of full-time focus. That’s a lie. And it is crippling to mothers who sincerely want to invest in the lives of their children but feel obligated to have some other ministry or pursuit in order to fulfill society’s expectations. Remember that the Proverbs 31 woman had seasons? You may very well be able to juggle several pursuits, depending on your circumstances (you have older children who are more dependent and helpful…you have extended family members who help–this used to be common.) BUT, you may not, and it’s important to know that your full time job mothering the hearts and souls of your children, being a manager of your home–all of which fulfills the role of helper to your husband is enough. Some days are hard. Some days are blissful. Some days are exhausting and you need to run to the Father and beg for more grace, more strength and a fresh perspective. Jesus was a discipler of souls. They pulled Him, tugged Him, pressed in around Him and took from Him at every turn. But he never lost sight of how precious they were, and how important His job of pointing to the Father, for the sake of their souls, was. He stole away to His quiet place, not to “find Himself”, but to be renewed so He could go back and pour Himself out again. Thank you for the reminder. Lately I have been feeling like I should be doing more. Helping at church more, volunteering at events, woking to add to the family economy, something…Just this morning I was asking God to settle the restlessness in me. I thank God for using you to deliver His words. I don’t need to be doing anything more than what I am already doing. Raising the children He has given me. thank you!!!!!! Your ministry is such a blessing to me. Perfect!!!! I just told my husband this morning that if, in a rush to get the day started, I do not snuggle with my daughter for awhile, the day usually turns out badly. It is the snuggle that keeps our day moving along nicely, even though it takes time at the beginning! Thank you. The truth, so well spoken. I know all of you moms with still so many little ones have heard this before..but,I’m here to tell you all..It is so true..and they grow up so very fast! I can say that now with three 20 somethings, a 19yr.old daughter and two growing up very fast sons who are 16 and 13.Forget what the world says and (sometimes the church) and just love and take care of your family for now! You will not regret it as they get older and you will REAP the benefits..I have time now to help with the 3yr.old class in church along with my 19yr.old but when I had many little ones in two different groups I didn’t do a whole lot but take care of my family! It was hard,I was tired, and overwhelmed.I still at times have to remember now that I am only schooling two kids that I STILL VERY MUCH need to give them the time that I gave their siblings..It has gotten easier in so many ways but I still give of my time to older kids also..just in different ways!When my youngest daughter graduated she gave a speech and said “I will be eternally grateful” for all the nights that my mom let me lay on her bed late at night and talk. I cried my eyes out because that was one of the things I privately grumbled about to my husband that wore me out.I had no idea it meant that much to her! !So..keep at it mommies of littles..May the Lord Bless you all today!! Thank you, Keri. We need more voices like yours to cheer us on! Thank you…I get so overwhelmed when I try (and fail) to do much more than take care of my husband and small children. I think those quotes are true…. to an extent. However, as I am finding, a mother with too “sacrificial” an attitude can also raise tyrants. My children are extremely demanding of my time and attention. I’m finding that I have not said “no” enough and have not expected them to wait enough. Now I have children who expect me to jump when they say “jump” and to listen to each and every running narrative they have of what they are doing. And respond appropriately. I am exhausted. I am not a slave to a clean house or a chore chart, but I find that I might have erred on the other end after reading so many “blurbs” on “taking time for your children” and “they grow up so fast” and all that. There is a balance and mothers do their children no favors by making them the center of their universe. I think you’re right–that the pendulum can swing too far the other way. We certainly don’t want our children to be made “the center of the universe”. I’m pretty sure, having read lots of Jankovic’s stuff, that she would agree too. It’s more of an admonition to not get caught in the trap of treating our littles like burdens and annoyances. A healthy balance is certainly important. Motherhood and homemaking are just looked down in our western world. if you are “just” a housewife you are nobody. This lie is so ingrained in our minds that even for those of us who do not believe it, it is hard sometimes. My husband and I were just talking this week about outside ministry and its impact on the family. I have been asked to serve at our church by phoning (and likely visiting) women members who have been inactive in their worship (which sounds like quite a few of them in our 1,000+ member church.) Apparently, my name has also been put on two other ministry lists recently; I expect I’ll be getting called soon about those, too. That is not to say we never minister to anyone outside our family, though. Because we guard our margins, we have opportunity to serve when unexpected events occur. If it weren’t for margin, we wouldn’t have been able to minister to our neighbors over a 3-month period a couple years ago when their son was born almost 15 weeks early. Nor would we have been able to assist the families of two dear friends of mine who recently went home to the Lord following 2- and 4-year battles with cancer. I say all this to point out that we’re all called to minister, but it’s important to make wise choices in deciding on the nature and timing of our ministry. If we don’t learn to seek God for His will regarding our season of life, our ministry to our families will almost certainly suffer. Sorry for my long post here, Kelly! Your post was very timely for me, and a great reminder that we don’t have to feel guilty saying “no” when it really means a “yes” to our families. I like what you said about having the opportunity to serve when something unexpected comes up. A friend of mine calls this “The Ministry of Availability”. Thank you for your kind words, Kristen. And I liked your friend’s term “ministry of availability.” It reminds me of an older woman from our congregation who brought a meal to us after the birth of one of our children. She made time to bless people with acts of kindness like that, and it taught me a lot about how being available can be a tremendous ministry and blessing as others’ needs, which God lays on our hearts to do something about, arise. I love that being home has provided great ministry opportunities outside “church” activities.I had the wonderful opportunity to minister to my sister-in-law just this week. She went into labor and I was the only one around to take her to the hospital. Her husband was over an hour away at work, her mother was 45 min. away. Everyone else she knows was at work. I had the blessed opportunity to help her through her labor and was there for the delivery of my nephew. She has said over and over, she didn’t know what she would do if I wasn’t available, probally had the baby at home alone. Her and I are the only two in our family that don’t work outside the home, and we wonder what everyone would do without us. We are the emergency babysitters, errand runners, etc. Which is also a time stealer if we are not careful. There will be weeks at a time where I am caring for other people’s children (regular sitter on vacation, sick, etc. )and it can be very draining. Just their presence throws off our routine, and can cause very hectic days. Regarding in-home ministry, like babysitting…I hear what you’re saying, Rachel! Ministry is a blessing, but it can certainly present challenges when we’re frequently called upon to serve others as moms who are home with our children rather than out in the workforce. You clearly have a heart for others, but at the same time recognize the effect it’s having on your home routine with your children. It really can be hard to say no to some of the opportunities to serve, especially, I think, when it doesn’t involve having to leave our own home (like babysitting, for example.) Yet home is a sanctuary, a place for family to rejuvenate and refresh in the Lord, and sometimes too-frequent extra-family contact can undermine our vision for a peaceful, orderly home life. You are wise that you’re thinking through the impact running errands, babysitting, etc. for others is having on your family life. Keep the vision, Rachel! 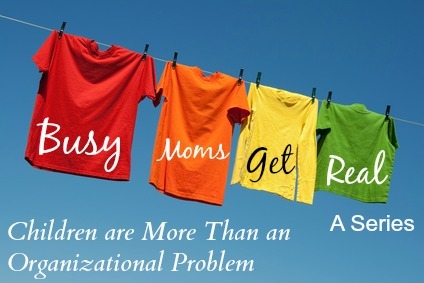 You’re doing a great job being observant and responsive to your children’s needs. Bless you as you raise your children for Christ! Thanks for the reminder – sometimes we can all become distracted with too many things, and forget those things that are really important! Thank you for reminding us women what our true calling is in this life. I so appreciate you for sharing your heart. You wouldn’t believe it Kelly, but I,m currently reading a very popular book about scheduling large families. I understand what Kristen said about not saying no to our children enough and producing tyrants and about saying no to the nagging thoughts that we need to be more than just a mother. You’re right it’s about balance (so is most everything in life.) I don’t feel for instance that I need to schedule everything so tight, that I never let one program of study run into the next. How did women time feeding infants before GMT? Just wondering?? I wonder how such tight sceduling applied to Jesus day? Clocks can be a great way of staying organised but they can also be a dictator, too. I’ve never heard of Jankovic but I’ll have to read her book too. I know my husband loves pottering in the garden with the children and I don’t mind doing the work to allow for this as long as it is balanced with them being resposible in the house also. It’s a journey isn’t it, raising large families…raising any family. Thank you for this post. I love Rachel Jankovic’s writing and consider her and Kelly my two most important sources for mothering help. I highly recommend Loving the Little Years and actually own two copies so I won’t be without mine when I lend one out! 🙂 You should all check our the blog she writes with her mom and sisters at feminagirls.com — she has a great post right now on specific child training strategies. With that said, I totally agree with and sympathize with the point that Kristen was making about that healthy balance. About six months ago I really started worrying about not spending enough concentrated time with my children and started letting them basically take over my days. I spoke with my Titus 2 friend at church about it and she reminded me that “discipline IS love” and that being home with them all day, every day is so much sheer time together that I didn’t have to sit and play with them while the house fell apart around us. This post and these quotes are simply to help us stay mindful of the correct perspective to enable us to make wise day to day decisions. I like to think of it like this sometimes: when I was in high school, I was a waitress at a local country cooking restaurant (not fancy at all). My main job was to wait tables. If someone sat in my section, they were my priority until they had their food and enough sweet tea. 🙂 Now, I had other duties as part of my job — rolling silverware, cleaning the bathrooms, bussing tables that had already left (we didn’t have busboys), and cutting up lemons for that tea. But I wasn’t going to delay taking someone’s order or bringing them their food that the kitchen had just put out for them because I had a bunch of silverware to roll. Part of my job was to figure out how to fit those secondary responsibilities into my time while keeping my current customers happy. And that’s how it is with mothering. We have to fit in our other duties around shepherding our children’s hearts, but they still have to get done as well. Thank you for your remarks. I am home with my children all day, every day. We homeschool, too. I feel like I’m always talking to them, interacting with them, holding them, hugging them, etc. But guilt always tends to be part of my life because I don’t sit down and play games with my kids, I don’t make cookies with them and do all sorts of crafts and fun stuff. For one thing, I’m just not that sort of person. That’s just not me. I guess I (and all moms) need to look at myself and accept myself for the mom I am and not try to be someone else. Another book I love is “For the Family’s Sake” by Susan Schaeffer MacCauley. Her big thing is not being the perfect mom, but being a mom who is “good enough”. Perhaps you are not one of “those moms” but I’m sure other things you do are just as meaningful! There are a couple of blogs I like to read, but I have guard my heart from guilt if I can’t do all the things they do. I have to remind myself that I’m doing just what I can do and that’s ok for now. We must also remember to guard our hearts against Satan’s lies. He is the accuser and I know that I am definitely an easy target at times. Last night, I was needing an attitude adjustment so I looked to see if you had any new threads on your RSS feed. This was exactly what I needed as a reminder! I laughed when I read, “Sacrifice … your quiet moment for their long retelling of a dream….” That’s my every morning and sometimes, I want to tell my little girl “that’s enough, ahhhh” but thankfully, I’ve refrained. I was reading this post . Which by the way is wonderful . And my eight year old daughter said” Mom can you put your phone down and watch me ? ” LOL !